I had some ideas about what I wanted to create, based on a mix of my own pragmatic and fantastical parameters. 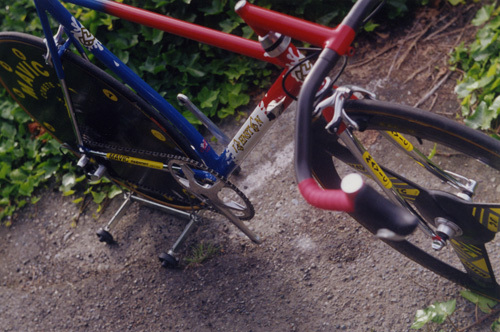 I wanted the frame to build into a time-trial (TT) bike—for two reasons: For one, these bikes seem cool, or at least somewhat intriguing, to just about anyone, whether they are generally into bikes or not (TT bikes were commonly known at the time as “funny bikes” because they looked so out-of-this-world). I also didn’t have a TT bike already, and I figured that I may as well try to impress my racer friends, too, by actually competing on the finished product. I wanted to build the frame out of steel tubing, the most time-honored frame material, and also the easiest material to work with. And, as ever, I wanted it to be over the top. 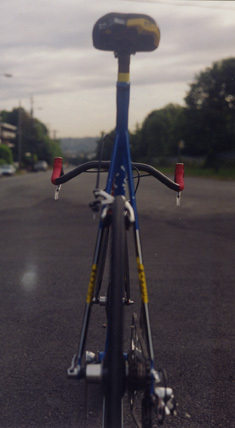 The frame was to be built with U.S.-sourced True Temper Aero Velo tubing, which featured several airfoil-section pieces, including the down tube, seat stays and seat tube, which also hugged the curve around the rear wheel—all for cool looks (Oh, and it may have made the bike about 2% more aerodynamic, too). 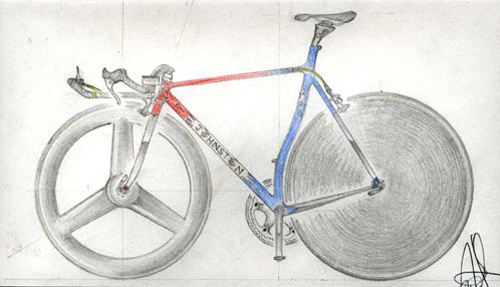 The tubes would be fillet-brazed together, partially chromed, and otherwise painted red, white, and blue, with my own custom graphics, marks, and logos. 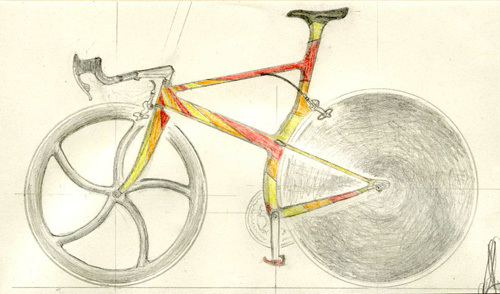 The finished frame would be built up with SSC components from the esoteric French manufacturer, Mavic. 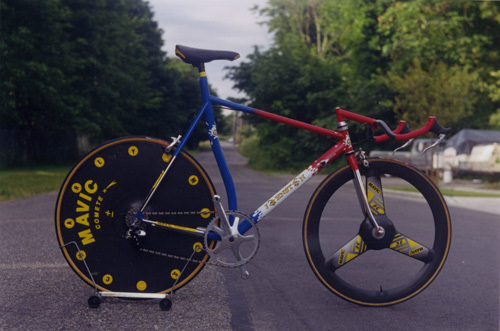 The wheels, too, would come from Mavic: the 3G trispoke front and the physicist-baffling Comete +/- rear disc, in which you could actually add or subtract custom weights depending on the course, supposedly maximizing potential gyroscopic momentum. 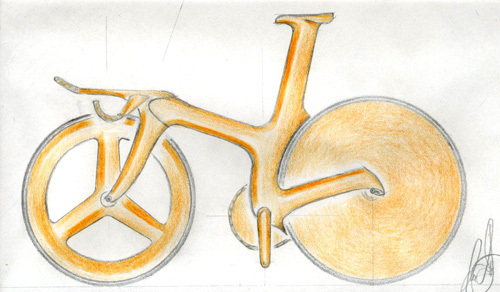 And yes, the two wheels actually are different sizes (on purpose). 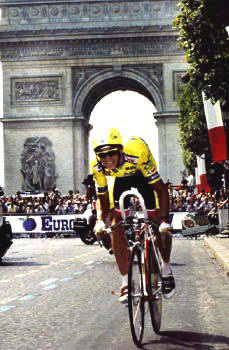 Coincidentally, most of of these elements were in common with the bike that the American LeMond piloted in his incredible comeback-victory ride into Paris in the 1989 Tour de France (referenced at the top of this post). 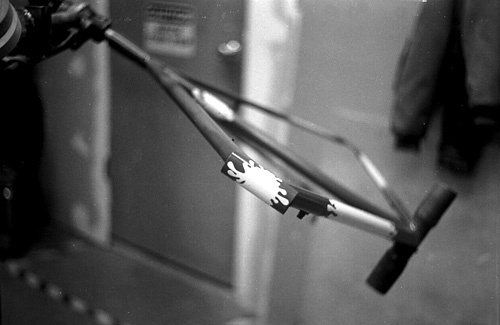 Being in the bike scene, I already knew several local frame-builders, so I began my research with regard to actually fabricating my design by talking to them. 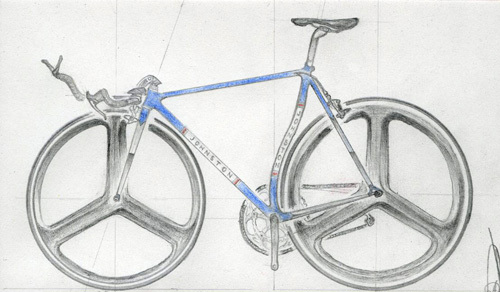 One suggested I read a book called “Designing and Building Your Own Frameset” by Richard P. Talbot, so I did. This book is quite inspirational, as the author, an engineer with no prior frame-building experience, researches, designs, builds, hand-letters, and paints his own frameset, and assembles it into a very handsome final product. And, he does it all in his garage or his back yard with little more than common hand tools and home-made wooden jigs. (Even the most modest professional frame-builder has a formidable workshop with at least $10,000 worth of specialized jigs and tools.) He then documents the entire process with remarkably-detailed and well-written explanations and excellent photographs (that he took, himself). I have never heard of anyone actually following Talbot’s book to duplicate his feat, but, theoretically, one could. I decided that I probably couldn’t. 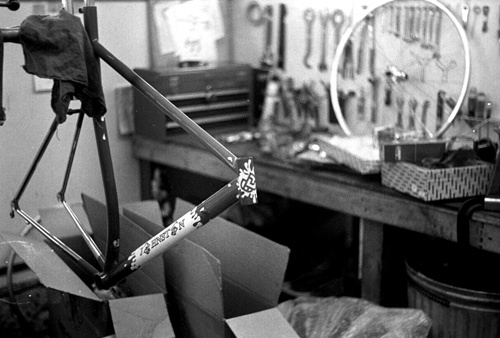 My next option was to go back to the frame-builders and have one of them teach me, directly, in their shop. 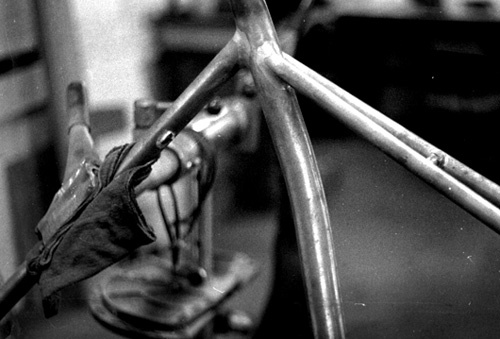 Luckily, Dave Levy (a fellow racer and proprietor of TiCycles) offered such a class. Here is a shot of the seat cluster area as the frame is being built. Notice the fillets around the joints, which have to be filed and sanded by hand into perfectly smooth radii between the different tube shapes. You can also see the outlet for the internal rear brake cable routing. Dave’s class ended up being a great experience, even if he did advise me to make a couple minor design changes that I would later regret allowing. Overall, he spent a lot of time showing and teaching me every aspect of the process, and the frame turned out well. 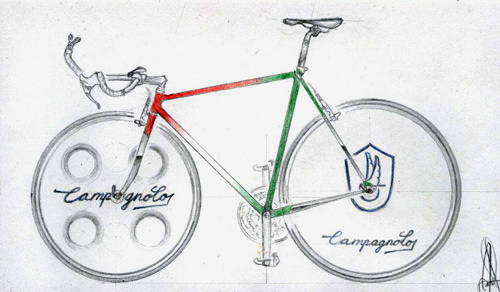 Once it was constructed and the fork and the rear stays were chromed, it was passed to a local painter. 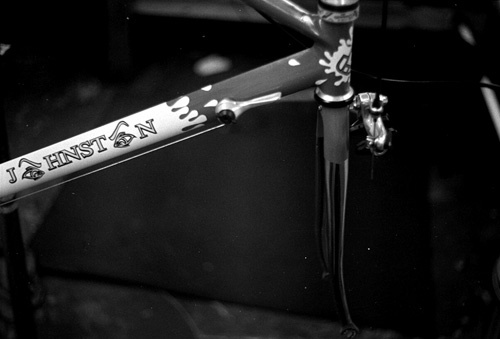 I had designed custom decals of my monogram mark to be used as head tube and seat-tube badges, as well as horrendous custom type for my down tube logos in which two glaring eyes took the place of the “O”s in “Johnston,” all of which I had rendered in a less-than-optimal outline execution (as if the eyes weren’t crazy-looking enough). These decals were to rest on “splash”-style white backgrounds that I had hand-cut from adhesive vinyl (this treatment, in combination with they eyes, gave either the impression of crying or immense perspiration; either way, it was expressive). I gave all of this, with detailed sketches for reference, to the painter and two weeks later—Voila! It was almost, but not quite right. 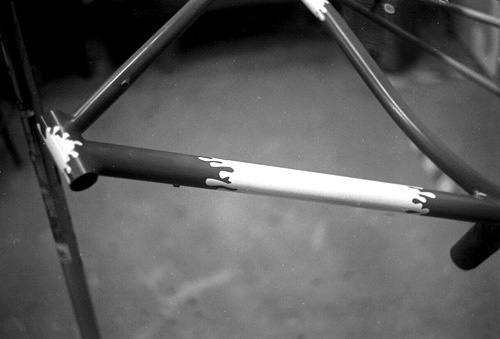 He actually called me in to apply the big down tube decal because he was skeptical of his own chances with it, so that came out okay, and the paint didn’t start chipping for at least a month, but, for some reason, he put both of my monogram decals on at a 45º angle. That didn’t please me, but at least it was consistent, and I got over it. Back from the painter, it was now time to take it to the shop where I worked so I could build it up with all of my specially-imported Mavic components (almost all of them had been discontinued, so getting new old stock was neither easy nor inexpensive). Needless to say, it took me well over an hour to build this thing; I think it was more like a week or two. 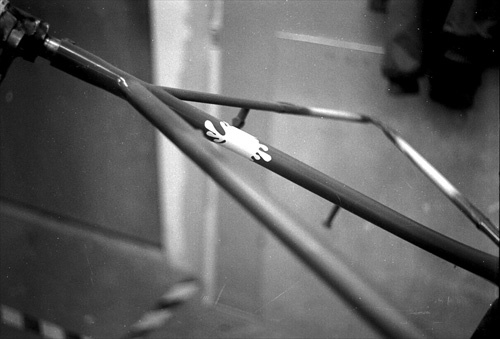 Aside from the usual prep-work – like chasing the bottom bracket threads, facing the head tube, brushing the seat tube barrel, and and sealing the frame against internal water damage – there was a lot of custom machining that I had to take care of, like drilling out the handlebars for aerodynamic brake cable routing, filing down the rear shifter mount to curve around the aero-section down tube, and sawing down the seatpost so it could sink low enough into the frame before hitting the curve in the seat tube. The most difficult, time-intensive, and, frankly, terrifying stage of the whole building process, though, was having to wrestle and glue claw-tight sew-up tires onto the world’s most ridiculously expensive, delicate, and practically-irreplaceable wheelset. This is how I was hoping my competition would remember it. Now, if you’ve gotten this far, you’re probably dying to know the real results: how I fared in relation to my classmates, and what grade I got. Well, to be honest, the only other project I even remember was Noah’s, who had committed himself to saving women, children, and furry animals from burning buildings as a volunteer fire-fighter for the better part of a year, but I’m pretty sure that dude was actually Jesus Christ reincarnated (nobody could humanly be as pure and good at everything as Noah). Taking Him out of the running, I’ll just go ahead and say mine was the best. And, for all the number-crunchers out there, I ended up getting a 3.9. Why not a perfect 4.0? My project didn’t actually fit into any of the three designated categories for the assignment. No matter… a pretty interesting tale, I don’t know anyone in high school that had that much initiative to actually design their own bike — although I did make a fine mouse trap car back in the day — and I do recall a guy that had a very interesting ‘project’ on ‘how to use smack’ with pictures with him demonstrating and everything, which was not so much interesting because of content, but reaction — everyone just sat there in a daze and learned the proper way to shoot heroin(I do believe he had to have a little chat with the teach after that though)– anyway, I was wondering how you were going to fulfill the community service bit of your project … and save the world on that bike… all explained though — 3.9… touche. Thanks for the comment, mkubee. We clearly went to different high schools, although it sounds like your mate put on a hell of a show. Presentation is everything.